From your bedroom closet to your laundry room and your guest room, it seems like space in the home is always at a premium. But with some strategic design tips and clever home organization solutions, you can make any room feel more spacious, organized and versatile. Get started with these ideas. Sharing a closet with your partner can be a challenge, but if you follow a few simple steps, you’ll find there’s more to love for both of you. Consider how much space each of you needs for everything in your wardrobe. 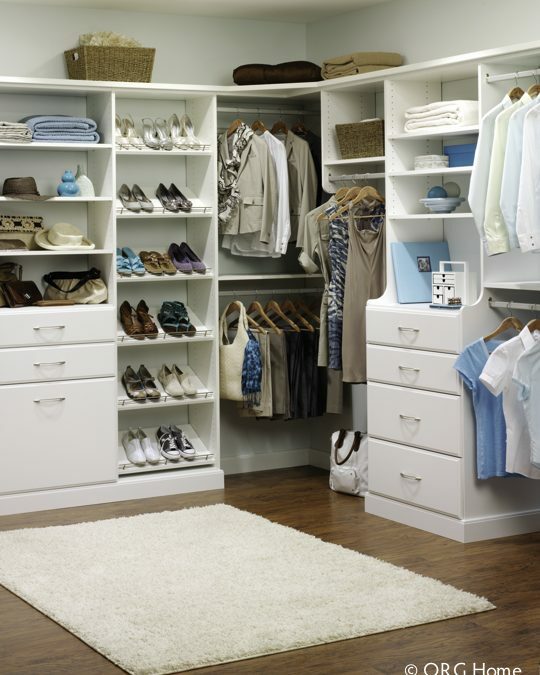 Split the closet into two sections with a central tower of drawers or a hutch to mark off your space. Use double hanging rods to keep your everyday clothes within arm’s reach. Include drawers that act as a built-in dresser to hold undergarments and socks. Add a fold-down ironing board for last-minute touch-ups and a pull-out hamper for worn clothes. Use adjustable slanted shelves to keep all of your shoes and boots on view. Ever wish you could spend less time doing laundry? Here are six quick ways to update your laundry room that will make this everyday chore faster and easier. Take advantage of vertical space by adding a custom organization system with cabinets, shelves, hampers, and baskets. Use pull-out laundry hampers to organize laundry as it comes into the room, and empty it into the washing machine when the hampers are full. Try a space-saving fold-out ironing board that’s easy to stow off the floor and out of sight when not in use. Add built-in hanging rods to air-dry delicates, and a slide-out valet rod to hold freshly ironed clothes. Treat yourself to an open countertop where you have plenty of room to fold clothes. We would love to help you organize your space. Contact us for a complimentary in-home consultation at 317.440.6964.